Who wants to spend hours planning meals and going to the grocery store when you can have everything you need delivered right to your doorstep? Perhaps that’s why there’s been a boom in grocery delivery services, enabling you to get everything from your weekly grocery haul to the exact ingredients needed for a new recipe delivered directly to your home. Online retail giant Amazon has emerged as a major player in the grocery delivery game. The company recently acquired Whole Foods for $13 billion, so it’s no surprise it has entered the food delivery market. Below, a rundown of Amazon’s food delivery options, including features like cost, availability, and intended audience. AmazonFresh has emerged as a budding competitor to other grocery delivery services such as FreshDirect, Peapod, and Blue Apron. Amazon, like its namesake retail site, also offers expedited shipping—as in, same-day or next day grocery delivery. You simply shop, schedule a delivery date, and wait for your groceries to arrive. You can also schedule your groceries to be delivered when you are home, or not home, depending on your preference. AmazonFresh offers a wide range of food options, from gluten-free to vegan choices to various offerings from Amazon subsidiary, Whole Foods. There are also prepared food and organic options, even specialty items like artisanal cheeses and meal kits. The meal kit options, which include meals like a veggie quinoa bowl with spiced chickpeas, pork ramen with fresh egg noodles, and Togarashi-spiced salmon with soba noodles, are another notable trend in the food delivery world. Yet the cost might be a bit prohibitive for some. AmazonFresh is only available for Amazon Prime members. On top of the annual Amazon Prime subscription cost, which is $99 annually, AmazonFresh will set you back an extra $14.99 per month, which is the cost of the AmazonFresh add-on. Amazon Fresh also charges a $9.99 delivery fee if your order is less than $40, while delivery on orders more than $50 is free. Another drawback of this food delivery service is its limited availability. AmazonFresh is only offered in certain cities. Most of these are major metropolitan areas, such as Seattle, Northern California, Southern California, and the New York and Philadelphia areas. So don’t get excited to ditch grocery shopping just yet. Not in the mood to cook? Amazon has an option for that, too. Amazon Restaurants is another popular food delivery offering from the online retailer. Launched in 2015, Amazon Restaurants allows Amazon Prime members to order food deliveries from popular eateries such as P.F. Chang’s, Applebee’s, and Olive Garden, as well as local eateries, as well. This new service has already emerged as a major competitor to GrubHub, another popular restaurant delivery service. The cost is two-fold. Amazon Restaurants is only available to Amazon Prime members, which, as mentioned, cost $99 annually. Delivery for Amazon Restaurant orders over $40 is free, while delivery for smaller orders range from $1.99 to $2.99. Another downside? Amazon Restaurants is only available in limited cities, which seems to be the norm for Amazon food delivery options. While it’s not solely a food delivery option, Amazon Prime Now offers members same-day delivery of household items, such as cleaning supplies, household items, toiletries, and—you guessed it—food. Food offerings available through Amazon Prime Now include Whole Foods Market, which includes many items from the popular grocery store, as well as various other kitchen staples such as dairy, produce, snacks, cereal, bread, and bakery items, frozen foods, and packaged foods, among others. You can also order wine, beer, spirits, and mixers through Amazon Prime Now, as well as pet necessities such as dog food and treats. Much like Amazon’s other food delivery options, Amazon Prime Now is only available for Amazon Prime Members. One-hour delivery for Amazon Prime Now costs $7.99, while two-hour delivery is free. Amazon Prime Now is only available in select cities. 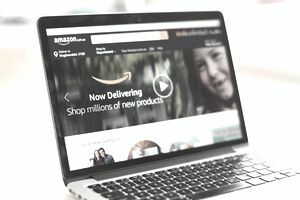 While Amazon is definitely making headway in the food delivery market, it may not be a viable option for many, simply due to cost and geographic location. So, before you ditch grocery shopping completely in lieu of your favorite online shopping destination, be sure to do your research and make sure Amazon's food delivery options are available near you. Does Your Dinner Come From the Grocerant?